If you happen to be planning a wedding for the holiday season next year it’s never too early to start thinking about decor and favors and fun things like that. 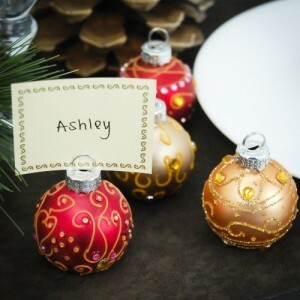 These mini ornament place card holders really need to be on your list of must-have items. Not only will they help you plan your reserved seating at the reception but they’ll add to the festive look of the tables. And as an added bonus you’re sending your guests home with an ornament they can add to their tree every year. The ornaments come in packs of four and feature a variety of colors and jeweled designs. We found these ornament place card holders here.